This article first appeared on 11/16/16. Jeff Eats just checked the Boca Black Box- box office and there are a handful of tickets left for The Hits Of Paul Anka! For those of you who might care- after the show, Jeff Eats and Mrs. Jeff Eats are going to “do” a late lunch/early dinner at Jimmy The Greek Taverna which is located in the same strip-center as the Boca Black Box is! Trust Jeff Eats…I know that this is a big time outing😜-Hopefully Jeff Eats and Mrs. Jeff Eats have the stamina to make it through the whole day- and have the energy to watch Madame Secretary later-on at home! 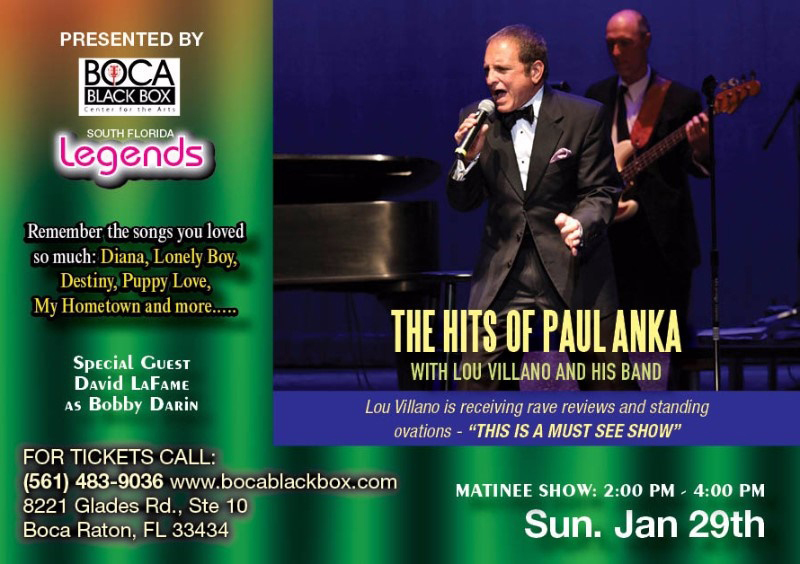 If you wanna see The Hits Of Paul Anka- bocablackbox.com also check goldstar.com (discount tickets). * The Hits Of Paul Anka. All I can tell you- Jeff Eats and Mrs. JeffEats have seen Lou Villano and David LaFame and they put on a fabulous show! Jeff Eats and Mrs. Jeff Eats are gonna be there. Tickets: bocablackbox.com also goldstar.com (discount tickets). Lou Villano grew up in Brooklyn singing the songs of some of the most popular singers from the 50’s & 60’s – Paul Anka was one of his favorites. While Lou was arranging his shows he remembered how many of his audiences would comment that his resemblance and vocal styling is very similar to Paul Anka. They asked “Why don’t you do more songs by Paul Anka”? That’s when Lou acted upon their advice. Lou becomes Paul Anka performing his hits – Diana, Lonely Boy, The Longest Day, My Hometown, Puppy Love, Destiny and so much more. Within the show are songs Paul Anka wrote for singers like Buddy Holly, Frank Sinatra, Tom Jones plus hit songs from some of his fellow songwriters and friends Frankie Avalon & Bobby Rydell. Lou is receiving rave reviews and standing ovations from his audiences performing this show. It’s a show that you are going to remember as you walk out singing the songs that you loved so much by such a talented songwriter and singer. “The Hits Of Paul Anka Live Show” is a MUST HAVE & SEE SHOW! ***** Jimmy The Greek Taverna, 8221 Glades Road, Boca Raton, Florida 33434, (561) 477-3272. Very original name, don’t-cha think…Jimmy The Greek! That aside, this “mom & pop” Greek joint serves some really dynamte-reasonably priced stuff. You can check menu/prices at www.jimmythegreekrestaurant.com. Over the past 3-weeks, I did 2- lunches and 1-dinner at Jimmy The Greek. Let’s just say, that the joint didn’t miss a beat–delicious gyros, pork souvlaki, char-broiled pork & lamb chops, Greek salad, moussaka, tilapia lemonato. Lots of food for the money…the most expensive “dinner” on the menu runs about 18 bucks. If you like Greek stuff, I think that you will really enjoy Jimmy The Greek. The joint is open 7 days a week 11am-9pm. Jimmy The Greek serves up terrific food. Live the site and your sense of humor. My favorite is Chris’ Taverna by Jimmy gets a real close runner up. Got 4 tickets for this afternoon. Doing dinner after the show at Boca Ale House which is right across Glades Riad from the Boca Black Box.